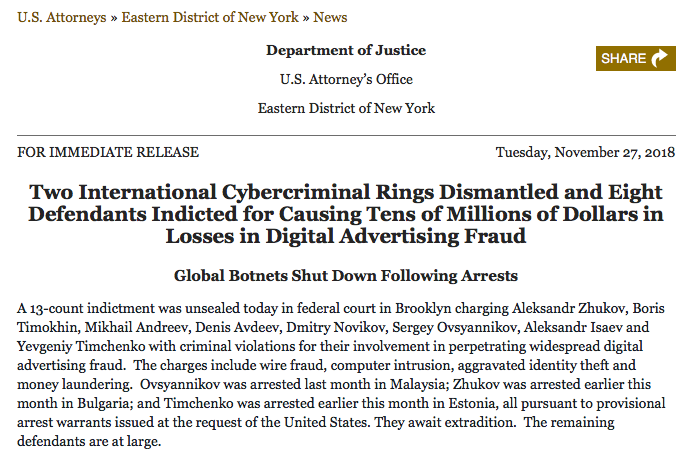 The Department of Justice unsealed charges against eight individuals for a widespread digital advertising hack using bots that robbed businesses of more than $7 million. The department also announced that a federal court unsealed seizure warrants allowing the FBI to take over 31 domains as well as seize data from 89 servers involved in the botnets, or networks of infected internet-connected devices that can be utilized by hackers. With so many people lining up to talk about “fake news,” it’s time to address the more nefarious and costly sibling: ad fraud. Ad fraud puts consumers at enormous risk, robs quality content publishers and brands of revenue and besmirches the image of online publishers by wrecking the user interface. Glad to see the DOJ stepping up on this, and hope there’s more action to come. Article in The Hill here, DOJ release here.